Ha “Sky” Neul right before playing his matches in the WEGL Starcraft: Remastered exhibition tournament at G-STAR 2017. The StarCraft scene just got rocked by a match-fixing scandal that feels like a blast from the past, given that it involves a tournament for StarCraft: Remastered, the remake of StarCraft: Brood War. Although StarCraft II has had a few match-fixing scandals of its own, SC’s most notable match-fixing scandal happened in 2010 in the Brood War scene and involved a ring of multiple pros and coaches. Yonhap News Agency reports that a 24-year-old pro StarCraft player got approached by a gambling site operator and asked to “manipulate the result of a quarterfinal match.” At G-STAR 2017’s StarCraft Remastered exhibition tournament last November in Busan, South Korea, the young pro “intentionally lost 2-0 after receiving 4.5 million won (US$4,225).” The betting operator has been arrested and the pro player has been booked. This wasn’t the only scheme that the conspirators had in mind. 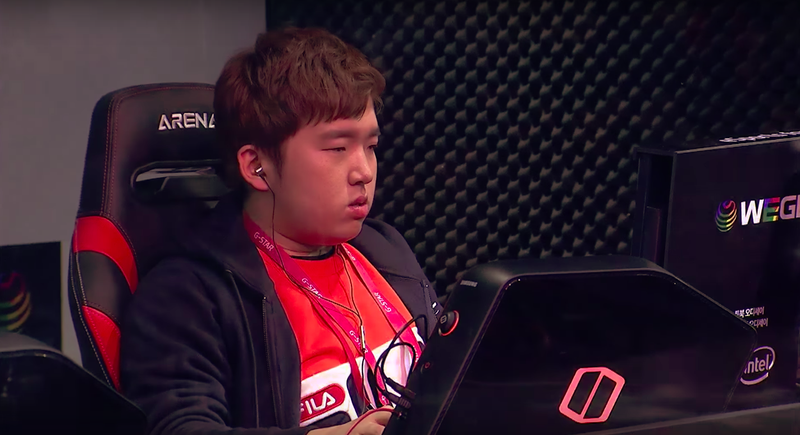 The police told Yonhap News that the pair had “attempted similar game-fixing” at Afreeca Star League 5, a ten-week tournament series that just started this week on March 11. Yonhap News does not name the suspected pro player, but there are only two pros who are 24 years old and who have appeared in both of the tournaments in question: Ha “Sky” Neul and Byun “mini” Hyun Je. Both players got 0-2’d in the quarterfinals at last November’s event, but Sky is the only one of the two who has taken down all of the past videos on his AfreecaTV streaming profile. Mini’s profile is still up, and he just streamed this morning; about 50 minutes into today’s stream, he appears to learn about the scandal as the news breaks and looks over Naver Sports’ coverage of the incident. Fans have taken to analyzing Sky’s matches from last November for signs of suspicious behavior, as well as his more recent competition appearances. This past Sunday on the first day of the ASL5 tournament, Sky won his first match but lost the second two. Assuming he doesn’t get disqualified, that puts him in the 17th-22nd bracket and nets him a paltry $280 in winnings. Byun “mini” Hyun Je is currently scheduled to compete this March 25.